Above Fort William mighty Ben Nevis dominates the view. At well over 4,000ft high, this mountain is the highest in the land. Most people take the 'tourist path' to Ben Nevis's summit and never see the dramatic north face of the mountain which delights rock-scramblers and challenges climbers. Nearby, Carn Mor Dearg another 4,000ft plus mountain is linked to Ben Nevis via the narrow curving crest of the Carn Mor Dearg arête. A day hiking away from the tourist tracks and into the heart of Coire Leis below Ben Nevis's vast north face. Clamber up 'Ledge Route' and 'Carn Mor Dearg arête', summer Grade 1 rock-scrambles. Bag the 2 Munros of Ben Nevis and Carn Mor Dearg. 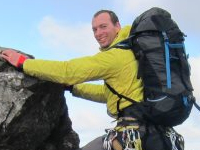 Improve your rock-scrambling skills on two of Scotland's finest scrambling routes. Rock-scrambling to Grade 1, demanding day. This event is a guided hill-hiking and rock-scrambling day up Ben Nevis via the Carn Mor Dearg arête and Ledge Route with one of our experienced and qualified leaders. The weather here can be changeable at any time of year, this should not affect the summits we are aiming for, but could possibly involve route alterations to get there. Guided hike and scramble up Ben Nevis via 'Ledge Route' and the Carn Mor Dearg arête. We'll meet early morning at the Ben Nevis North Face car-park, then walk to the CIC Hut hiding below Ben Nevis's massive cliffs. The route we'll then be taking onto Ben Nevis is 'Ledge Route'. This is classed as an entertaining Grade 1 rock-scramble and reckoned to be the best summer rock-scramble on the mountain. It's the navigation that's challenging, knowing where to turn and what to climb up ! We briefly join the crowds for a short section to reach Ben Nevis's summit, then head of in the direction of the Carn Mor Dearg arête for some more easy, but airy rock-scrambling. Onto Carn Mor Dearg, that's two 4,000ft plus mountains climbed ! Our route is weather dependent and if conditions dictate, we may hike the route in reverse. This would still allow us to have fun along the Carn Mor Dearg arête, but we may miss out Ledge Route, descending instead via the 'Halfway Lochan'. Guaranteed still to be a spectacular day ! On our May event, there may still be snow in the gullies and if this is the case, we'll not aim up via Ledge Route. Our route has good paths through grass and heather clad slopes leading to rocky and bouldery terrain higher up. We've classed the day as 'demanding'. The route takes in some rock-scrambling up to Grade 1 and some of this is exposed and airy. If you've never been rock-scrambling before, then this day is a fine introduction - we'll show you techniques and how to move along ridges and up easy rock. You'll gain a sense of achievement knowing you've taken challenging, yet quiet routes up Ben Nevis and its neighbours. Leading the event on 10 May'19. Leading the event on 28 June'19. Our day begins from the Ben Nevis North Face car-park at Torlundy which is around 3 miles north-east of Fort William. There are good public bus and train transport connections to Fort William. We may be able to offer pick-up from Fort William.